We are delighted to have recently welcomed Yogesh (Yogi) here at Heathcote House. Yogi specialises in treating patients with periodontal (gum) disease, surgically removing wisdom teeth and replacing missing teeth with dental implants. 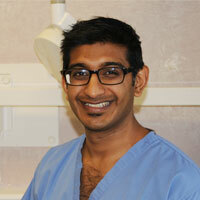 He is a GDC registered Specialist in Periodontics and works as a Speciality Dentist in Oral and Maxillofacial Surgery at the Royal Sussex County Hospital, Brighton. He is always happy to accept referrals for periodontics, oral surgery and dental implants. As a patient here at Heathcote you can be referred in house by one of our dentists. Yogi also accepts referrals from other Practice’s for Patients looking for specialist treatments. Please click here for a list of all treatments and prices.